This item is a Cesium Atomic Clock, made by Hewlett-Packard, widely known today as HP, around 1970. The Cesium Atomic Clock is enclosed in a grey metal casing with an analog time display and three output frequencies. There is an embedded panel which contains advanced displays and adjustment controls. This clock uses the radiation that is emitted when electrons in a cesium-133 atom changes energy levels to keep time. Within an evacuated tube, visible to the left, the clock selects cesium-133 atoms in the appropriate state and exposes them to microwave radiation. This induces electron transitions in their hyperfine energy levels. The atoms that have made transitions are detected by an electron multiplier. This signal is used to feedback control the frequency of a quartz oscillator. In accordance with the International System of Units (SI), one second is the duration of 9,192,631,779 (9 billion, 192 million, 631 thousand, 779) cycles of radiation from the energy level transition of the cesium-133 atom. In effect, the Cesium Atomic Clock measures the frequency of the transition and divides by 9,192,631,779 . This model of cesium clock greatly improved on the accuracy of previous models, bring the error in the accuracy of frequency measurements down from 1*10-11 to 7*10-12 , a reduction of 30%.Clocks such as this one were flown around the world in opposite directions in order to provide experimental evidence for the Special Theory of Relativity. According to Special Relativity, clocks that are moving relative to the earth should read a shorter time than the ones that are stationary on the ground. Because the planes move at relatively slow speeds the time difference should be between 40 to 275 nanoseconds. In order to reliably detect such tiny time differences the clocks needed to be extremely accurate. 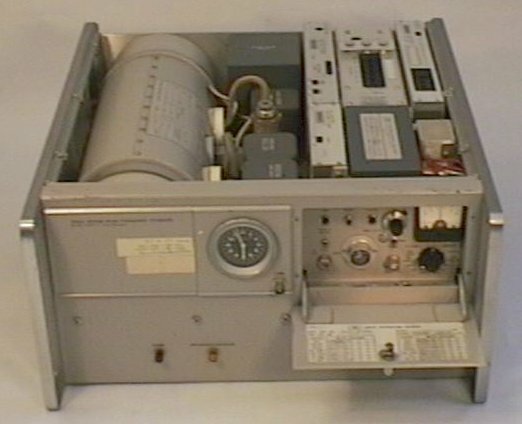 This particular clock was used in experiments with ULF waves used by the Omega Global Navigation System. Hewlett-Packard was founded on New Years Day in 1939. The cofounders David Packard and William R. Hewlett decided the order of names for their new company with a coin toss. Their first big order was eight HP 200B audio oscillators which Walt Disney Studios ordered for the creation of the movie Fantasia. In 1959 HP entered the international market, expanding into Switzerland and Germany and in 1966 their first computer was introduced. Around the World Atomic Clocks Predicted Relativistic Time Gains: J.C. Hafele, Science, 177 (1972) 166-170. "40 HP Innovations that Mattered"